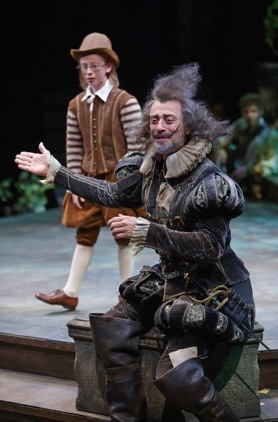 The Stratford Festival’s latest production of Shakespeare’s comedy Love’s Labours Lost is significantly better than the Festival’s last production of it in 2008, but the play that depends so much on balance and symmetry is undone by the unevenness of the cast. The play has virtually no action. The characters wind up at the end in the nearly the same position they were in at the beginning. Thus, the prime interest in the play is in wordplay that can engage us if spoken well, but easily can bore if spoken indifferently. The present production boasts at least two outstanding performances that show us how the play could succeed if more of the cast were operating on a higher level. In the main plot the young King of Navarre and his three friends vow to to shun the society of women the better to devote themselves to three years of study. It so happens that King had previously given permission for the Princess of France to visit. When she arrives with three of her friends, the King agrees to deal with the state matters they have in common but refuses to allow the ladies to lodge in the palace. The plot works according to strict geometry, so there’s no surprise that the four men soon one by one break their oath and fall in love with the four visiting ladies. In the subplot we find a comic rivalry between the fanciful, Don Quixote-like Don Adriano de Armado and the earthy peasant Costard for the love of the country wench Jaquenetta. At the play’s unusual conclusion, reality intrudes on the highly intellectual and romantic world of the play so that the four young men who had voluntarily taken a vow of chastity find they must renew this vow in order to secure the faithfulness of the women they love. The production designed by Patrick Clark and lit by Michael Walton is gorgeous. As in the 2008 production, the setting has been moved forward from the 16th century to the 17th so that the men in slashed pantaloons, doublets and lace collars and cuffs look rather like the Four Musketeers while the women in petticoated floor-length pastel gowns all look like fairy-tale princesses. The one performance that shines above all others is that of Mike Shara as Berowne, one of the King’s three companions. Berowne is the most sceptical of the the four companions before he agrees to the oath and serves as a prime commentator on the others’ actions. Shara delivers Berowne wryly humorous speeches with admirable clarity while giving the impression that their often complex wordplay is the character’s sudden inspiration. Shara's presentation of Berowne’s Act 4 speech, “’Tis more than need”, the longest speech in all of Shakespeare, is a model of lucidity as Shara’s subtle use of emphasis and phrasing guides us through Berowne’s beautifully reasoned explanation why he and the other three comrades should feel no shame in having broken their oaths to fall in love. While famed British director John Caird allows Shara to play Berowne without any directorial encumbrances, he forces odd interpretations on the other three comrades. His worst idea is to have Sanjay Talwar play the King of Navarre as if he were dimwitted. This notion is one way of explaining why the King would conceive of a plan so contrary to human nature to starve the body to nurture the intellect, but it is a very superficial way to set up the action. The King and his friends have to believe they are doing something noble and manly by forswearing the company of women, rather than giving the impression they are just humouring their king because he is their friend. Caird gives Longaville (Andrew Robinson) and Dumaine (Thomas Olajide) physical habits presumably to help distinguish the nearly identical members of the foursome from each other. Caird has Robinson constantly snapping his fingers when he speaks and Olajide he has performing acrobatics when expressing his joy. It’s amazing that Olajide can speak his lines clearly while doing switch leg leaps, but both the acrobatics and the snapping are nonetheless distracting. ng a sense of excitement even when she is not speaking. As for Boyet, the one male member of the French court, John Kirkpatrick manages to present the character as a lively but sensible advisor and not the effete dandy as he is too often played. Among the menagerie of curious non-courtly characters, the Spaniard Don Adriano de Armado is given an outstanding performance by Juan Chioran. Caird links Don Adriano closely to the theme of wordplay in which all the other characters are involved and particularly to the idea that words can embellish and even change ordinary reality. Chioran’s Don Armado is eccentric to be sure, but not so fantastical that he ceases to be human. In fact, it is Don Armado’s desire for the earthy maid Jaquenetta (Jennifer Mogbock) paired with his antique form of self-expression that make him such a humorous figure. As Don Armado’s precocious page Moth (Gabriel Long) is a pleasure throughout. He speaks his lines clearly and with youthful gravitas and is excellent at imitating the other characters. As the schoolmaster Holofernes, Tom Rooney ought to be one of the most comic characters, but Rooney seems to forget that Holofernes is meant to to stuffy and petty and for some odd reason tries to make him as lively as the male courtiers. Luckily, Rooney is paired with Brian Tree as the curate Sir Nathaniel, who aptly demonstrates how much humour such a fustian gentleman can generate. At the very end of the verbal scale is Brad Rudy as Dull the constable who looks on varied events with total impassivity and utters only a minimum of words. The odd man out in terms of acting style is Josue Laboucane as the peasant Costard, also in love with Jaquenetta. While the other characters move with stately elegance, Laboucane’s Costard leaps about like a clown escaped from Cirque du Soleil and delivers his lines in a highly exaggerated style. He starts out so big he misses the humour of Costard’s increasing frustration at having to deal with a world filled with eccentrics and would-be intellectuals. The main virtue of the new Stratford production of Love’s Labours Lost is that it has more vitality, largely due to the performances of Shara and Chioran, than have previous productions of the play since Michael Langham’s staging in 1983 that was such a success it was remounted the following year. Despite some odd directorial choices, Caird nevertheless presents the issues of the play clearly. The play is a subtle exploration of the paradoxes of reason and language. That man can use reason to keep his desires in check is part of what makes man human. Yet to deny desire entirely is also to deny part of our humanness. Language, as the play makes effusively evident, can be used to disguise as much as reveal the truth. If only the entire cast were operating on the same high level as Shara and Chioran, the play would lose its present aura of long-windedness and live up to its reputation for eloquence. 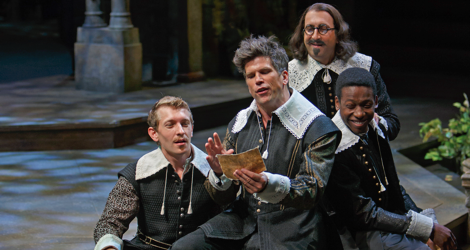 Photos: (from top) Andrew Robinson as Longaville, Mike Shara as Berowne, Sanjay Talwar as the King of Navarre and Thomas Olajide as Dumaine; Gabriel Long as Moth and Juan Chioran as Don Adriano. ©2015 David Hou.